Niamh O’Mahony is a 2015-16 CASE Europe Graduate Trainee in the development and alumni office at Trinity College Dublin, Ireland. I am the first CASE Europe graduate trainee stationed outside of the United Kingdom. I work in the development and alumni office at Trinity College Dublin in Ireland. View of Trinity College Dublin’s Campanile and Front Square. Copyright, Trinity College Dublin. My first four weeks as a trainee have been a whirlwind of activity and learning. Each day brings new challenges and opportunities. I want to express my gratitude to all those involved in the CASE Europe Educational Fundraising Graduate Trainee Scheme—from the programme founders, managers, mentors and the 13 other CASE graduates for 2015-2016 year to the team at Trinity who have created such a dynamic and enthusiastic work environment. My first CASE experience came in the form of the graduate trainee induction week and the 2015 CASE Europe Annual Conference in Manchester, U.K. The induction week—hosted by our external mentors, Lyndsay Lewis and Chris Gethin—included a whistle-stop tour of the advancement industry, presentations on the key functions of a development office and on our roles at each of our respective institutions, and advice on how to get the most out of this 12-month programme. We spent the three-day annual conference moving between specially selected conference panels, core skills workshops and small-group presentations from industry experts. It is a testament to the supportive nature of CASE—and of the advancement profession more broadly—that so many people gave their time to speak with us about their experiences and offer advice. It was a very busy week, and it left me feeling grateful for the opportunity that CASE and Trinity made possible, excited for the 12 months ahead and looking forward to my first day of work. 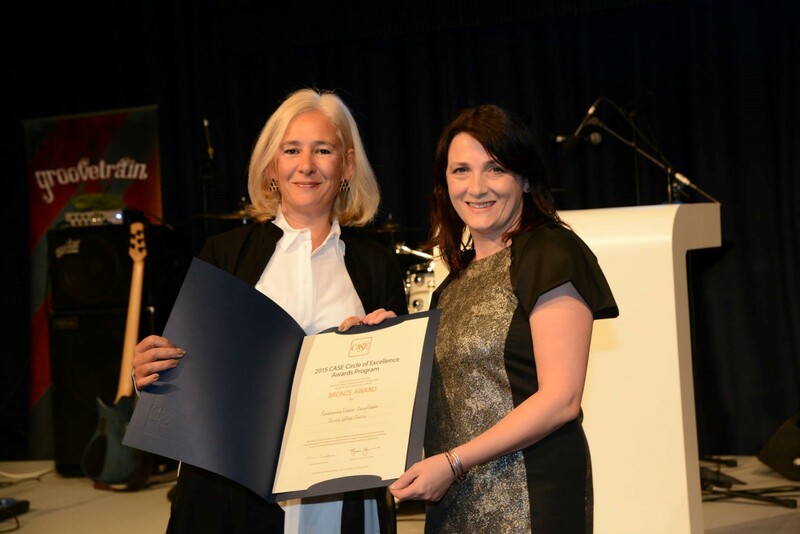 Maura Horan, college web officer/manager at Trinity College Dublin, accepts a fundraising award with CASE President Sue Cunningham, at CEAC 2015. Trinity College Dublin was founded in 1592 and is situated at the heart of Dublin. The Trinity Development and Alumni Office is located on the east side of the University Chapel; we share our ground floor with the chapel precentors, whose dressing room leads off to the left of our reception area. Trinity Foundation, as the office was formerly known, was established in 1994, and has since grown to a diverse of team of 25 staff members. Last week was freshers’ week on campus and the iconic front square of the university overflowed with the stalls, stands and displays of university clubs and societies. The new undergraduates brought a festival atmosphere to campus. I gave a short presentation to the arts, humanities and social sciences first-year students on the Trinity Development and Alumni Office and what we can do for them. Looking out at the students sitting in the Edmund Burke Theatre that morning, I thought of my own first days as an undergraduate student—the excitement and the anxiety—at University College Cork 10 years ago. I was also struck by the parallels between us as we set out on our new lives at Trinity. As a trainee, my main responsibility is to assist with the development of a fundraising plan for the university library, which has been a great learning experience. So far, aside from working on the library plan, I assisted with alumni dinners, scheduled a New York visit by senior university representatives and managed the office reception. Bearing in mind the oft-repeated advice from the CASE Europe Annual Conference to “learn your university’s stories,” I attend as many university tours and talks as possible. Next on my reading list is Peter Fox’s 2014 book, Trinity College Library Dublin: A History, which will help me get up to speed on our 400-year history. I am enjoying being an intern. It affords me the opportunity to occupy a position of naivety and benefit from diverse perspectives on the institution and on the advancement industry.